1 Among all 17 species of penguins, the yellow-eyed penguin is the oddest one! It lives in the southern part of New Zealand. 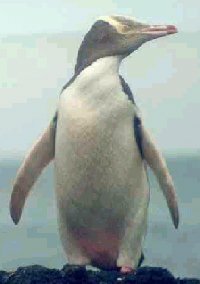 It is the only type of penguin that likes to live alone. It is also the rarest type of penguin. There are only about 4,000 yellow-eyed penguins left in the world. 2 This bird appears to wear a grayish blue feather jacket with a white shirt covering its chest and belly. The yellow-eyed penguin has cat-like yellow irises and a striking yellow headband. The Maori, the aboriginal people of New Zealand, named this bird for its voice. They called it "hoiho," which means "noise shouter." The yellow-eyed penguin gives out high-pitched, ear-piercing calls when it is claiming territory, courting, greeting other penguins, or feeling threatened. Sometimes, we hear its calls before we see a yellow-eyed penguin.